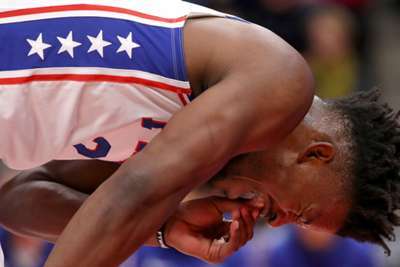 Jimmy Butler left the Philadelphia 76ers' matchup with the Detroit Pistons after straining his groin in the first half. Butler missed all three of his shots and grabbed four rebounds in 10 minutes of action before leaving Monday's game. Philadelphia acquired four-time All-Star Butler from the Minnesota Timberwolves last month in exchange for a package centred around Robert Covington and Dario Saric. Butler has averaged 21.4 points and 5.3 rebounds in 12 games with the 76ers. The 29-year-old has also shot 49.5 percent from the field and 42.9 percent from three-point range during his time in Philadelphia. Philadelphia entered their matchup with Detroit having won five of their last six games.